Samsung is almost ready to announce a new Galaxy Note flagship smartphone - most probably called Galaxy Note 9. 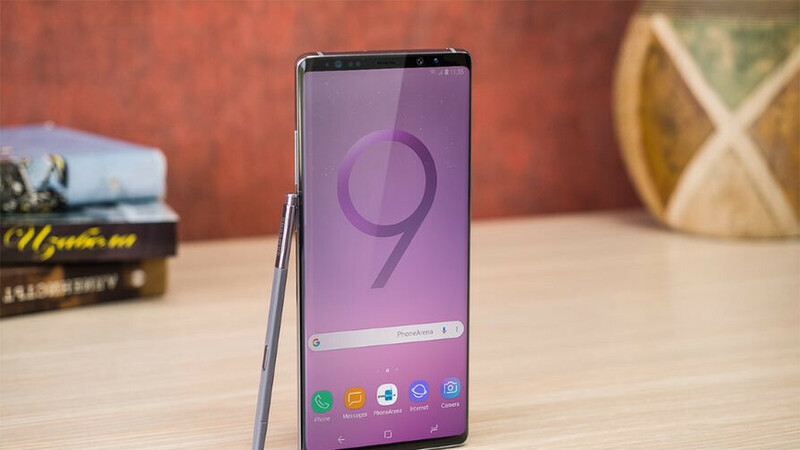 While we're still more than a week away from the announcement event, we know plenty of things about the Note 9, as leaked details and images have been abundant lately. The newest Galaxy Note 9 leak reveals the phone's launch prices in Indonesia, as well as the official names that some of its color variants will have: Mystic Black, Engineered Blue, and Artisan Copper. According to the promo poster seen below, the Samsung Galaxy Note 9 128 GB will cost 13,500,000 Indonesian Rupiahs - that's about $936 USD at today's exchange rate. The Galaxy Note 9 512 GB will be significantly more expensive at 17,500,000 Indonesian Rupiahs - about $1,214. In case you're wondering, a Note 9 64 GB doesn't seem to be in the making. All in all, as previously reported, we're certainly expecting the Note 9 128 GB to cost a bit less than $1,000 in the US, with the 512 GB model being about $200 pricier. European prices are bound to be slightly higher, but that's another story. 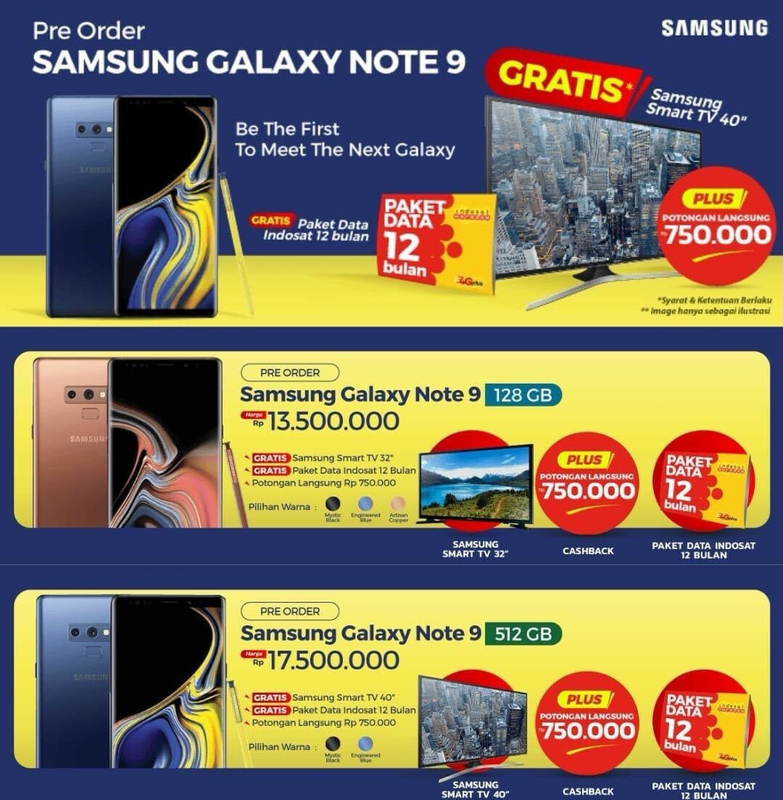 Apparently, in Indonesia, both the 128 GB and 512 GB versions of the Galaxy Note 9 will come with free Samsung TVs as pre-order gifts. While this is likely just a local promotion, it's highly probable that the Note 9 will come with some gifts in the US, too, possibly including a free Gear S3 watch. Samsung is already praising the Galaxy Note 9, presenting it as the only device you need for "work, play, and everything in between." At least for some customers, the new phone may very well be that, but we won't know until the device hits the market. Meanwhile, if you're curious about the changes and new features that Samsung's next big thing is supposed to bring, read our Galaxy Note 9 rumor review. I hope we get 515 GB in America. Well, because it’s a freaking portable computer. Or they could make and sell both options and you can get what you want and they can get what they want... would that maybe work for you? You think you could be ok with that? Wow, so it looks like Samsung really is going to take the dive and make 128GB the base storage option. Pretty bold of them! Also a great move because it will now put pressure on all other manufacturers to follow suit, which is good for all of us customers. What do you guys need the 128GB storage for on a phone? I can understand getting a couple terabytes on a laptop or a desktop, but on a phone! I have more than 45GB free on my 64GB phone, and I doubt I'll need more. I guess not taking photos and videos helps. I would rather save $50 on the phone and get 64GB, or save even more and get 32GB. yup...i take lots of photos and videos and 64 gb feels like nothing. So I can use laptop and TV less. I watch all my videos and put all my music on my phone. Then get a phone with that. Android has options. No one is making you buy anything else. I did that, got a Oneplus 6 64GB variant. Paid half the price compared to other phones for marginally worse camera(which I don't use anyway). I don't think I was complaining, just curious as to why people need that much storage. The answer seems to be 4k video. I was just looking over the specs for my Motorola Droid from 2009. It has a breathtaking 256MB of built-in storage. A 16GB micro SD card came pre-installed in the Droid; expandable up to 32GB! How far we've come in nine years. My first high end laptop had a ridiculously high 16gb hard drive in it. No way in heck anyone would ever need that much space. Absolute overkill. I got a free 40" tv a few years back with an LG phone. It isnt anything new. "Paket Data Indosat 12 Bulan"; cut me off a slice of that. All those gigabytes (512) are needed. 4K video uses a lot of gigabytes. Easier to record to and edit from native storage then transfer, then backup. Current note 8 price in my country is $1037 after tax so a $936 note 9 might already be a good buy. I guess 128gb base for mid and flagship phones should be the new norm. Huawei is already doing that with Nova 3/3i and I guess more of their phones will follow with it. 128GB should have been the norm on Samsung phones starting with the S6, which had a 128GB option. The very next year with the S7, they should have been 128GB minimum. But I would say, once 4K was available on Samsung phones, they should have went 128GB, with a 256GB option. I think the Galaxy S should be 128 and 256, while the Note should be 128GB and 512GB as an option. after all, since Samsung makes their own flash, it cost them exactly the same to make either, no matter how much they charge us for it. I swear if my country bundled a TV with purchases like LG and Samsung I'd gladly pay these extremes. The s9 is bundled with a $40 JBL clip 2 and is sold for above $1000 usd because we have 45% import duty on phones. The iPhone x cost about 2000usd equivalent. Useless 6 gb Ram What about 8gb or 10gb or 12gb Ram options?